Sales and Repair "Come See Us" !!!! Pickup and Deliver your computer to a residence or business. This includes basic computer setup. Additional labor charges might apply for any additional installation requests. 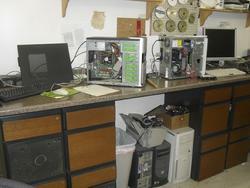 Diagnostics will test all the core components of a computer to ensure they are functioning correctly. This might also include software testing and an overall evaluation of your computer depending on the customer’s request. If your machine is running sluggish, a computer optimization might be just what you need. This process is customized with every computer depending on the difficulties the customer is experiencing. The newest updates, security software (anti-virus, anti-spyware), defragmentation methods, and immunizations come standard in this procedure. Why not have Harford Computer install your software? With us, we can guarantee it will run to the best of its capabilities with the newest updates pre-installed for you. Do you need a hard drive, DVD-ROM, or any other component installed in your desktop? This is the same as the previous listing, however certain parts such as motherboards, proprietary components, unique or custom devices, as well as certain laptop parts take much more time and experience to install. Do you have critical information on your computers that cannot be put in the wrong hands? Take your computer to us and have a Hard Drive security wipe performed on it. We will erase all the data on your hard disks with a method very close to that which the Department of Defense uses. An OS Install consists of a short format and wipe, followed by the installation of your operating system of choice. Once the computer is up and running, the process is then ended. No updates, drivers, or software will be installed. Drivers and updates are critical for a computer to function correctly. A driver tells the system how to use a component. For instance, if you cannot hear sound or see video, chances are it is a update or driver missing from your computer. All possible updates to your computer are installed at this point. This does not include anti-virus or anti-spyware immunizations. A complete system restore will bring your computer back to a factory state. We will wipe your disk to ensure nothing is migrated to the new installation. After this process is completed, we install all of the necessary core software and updates needed for your computer to run correctly. Finally, a suite of anti-spyware and anti-malware will be installed to prevent your computer from malfunctioning again. This package includes everything a Category 1 system restore entails, with the addition of a complete data transfer. We will remove your data before wiping the drive followed by the creation of a backup CD or DVD for your convenience. All data will be virus scanned for security reasons. Certain programs and application data cannot be saved! Check with a technician to ensure your data can be transferred.